Last week I participated in a watercolor workshop led by Jan Hart, as artist who lives in Costa Rica. She has an enormous amount of knowledge about pigments, which was very interesting. In the past, she worked very closely with the Daniel Smith company and she started us out with samples of a few of their paints. She had us use a very limited palette consisting of Ultramarine Turquoise, Quinacridone Sienna, Nickel Azo Yellow, Quinacridone Magenta, and Zoisite(one of Smith's proprietary PrimaTek pigments.) While this is a rather bizarre palette, she wanted us to understand the unique properties of the paints. Above you see my first painting from the workshop-it's from a reference photo I took of kohlrabi that I grew in my garden, laying on an old tarp. This may be my all-time favorite thing I've ever done! It isn't exactly what one might hang in the living room, but I just love the way the colors blended on the paper and the loose, casual look that I labored so hard to achieve! 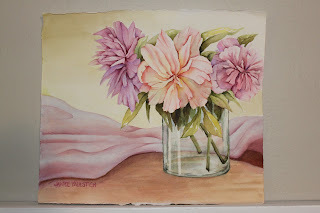 My second piece was a vase of peonies that I have painted before (and posted a couple of months ago.) The soft cloth in the background gives it a surreal look. I used the same palette as above, plus Permanent Rose. I like the way the peonies turned out, but I'm back to my ususal controlled style. I still want to do these again. By the way, I used quarter sheets of Arches cold press for all of these. 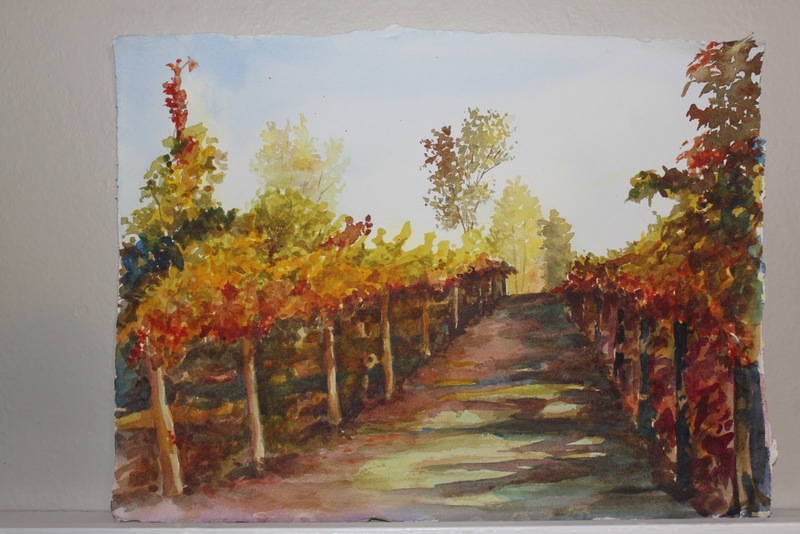 All was not rosy in the workshop-I tackled a beautiful landscape photo of a vineyard that our friend Erick took a few years ago. This time I used the same palette with the most unfortunate addition of Cadmium Red (WHY??? I've always hated this pigment!) On the last day of the workshop, Jan took on the challenge of "saving" a couple of paintings people had despaired of fixing, including this one. Even she couldn't salvage this overworked disaster! She added all sorts of colors but it was too late. RIP, vineyard. There's a 4th painting I still have to complete-may post it at a later date. 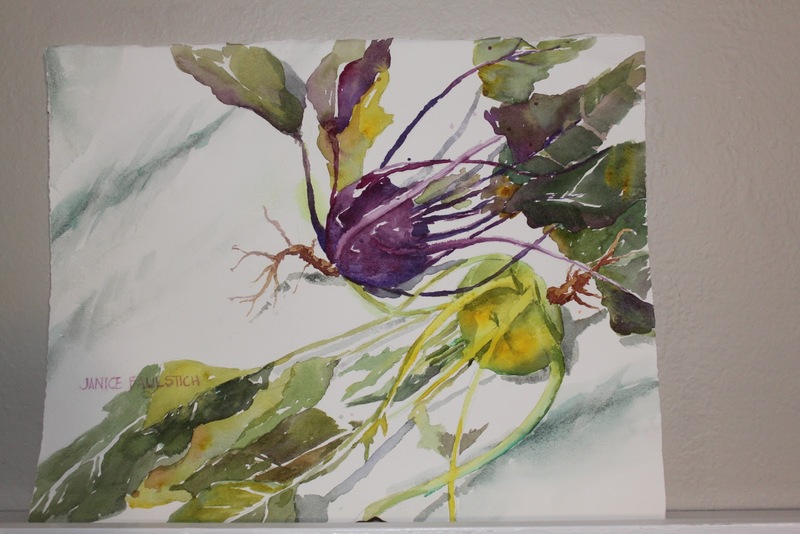 I like the kohlrabi too. Like the leaves and the purple bulb. It is loosey goosey looking, like you just tossed paint on the paper in a few minutes. I looked back at your first peony picture. This one is a little different, as you say more controlled. I thought I liked the glass vase before, but I really like it this time. But I still like the paint splatters on the first attempt. The grape vines look ok to me, but who am I? I really like the trees in the back ground. Janice, love the Kolrabi painting. If not the livingroom, surely the dining room or kitchen. Your failed painting is worth doing again with your new-found knowledge. I love the perspective. Thanks for driving to plein air yesterday. Great fun.